First off, a big round of applause has to go out to the Edmonton Oilers for making the playoffs for the first time in a decade. The team has been through a lot and for fans who stuck with this organization through some of the worst times in the franchise’s history, they deserve to finally see their team try to win a Stanley Cup. With that in mind, to date, we’ve examined what a first-round matchup for the Oilers might look like should Edmonton wind up facing either the Chicago Blackhawks or the Anaheim Ducks. While I believe both series would be hard-fought contests, potentially dragging out the full length of the series, one favors the Oilers (Anaheim) and one does not (Chicago). 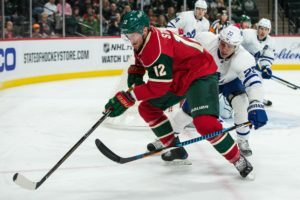 We have a few additional teams to explore and part three takes a closer look at the Minnesota Wild. At one point, Minnesota was the team to beat. A terrible month of March has Minnesota dropping in the standings and a good month for Edmonton has the Oilers moving up. Minnesota could still win the Central Division, but it would take a major turn-around in their play with some faltering by the Blackhawks. More possible, but still unlikely, Edmonton could drop in the standings with a few losses and occupy the second wildcard spot. Nasvhille, Calgary and St. Louis are all strong enough teams to make an upward move thus altering the entire Western Conference playoff picture. It’s possible these two teams play each other in the first round but it seems more likely both see different opponents. Still, for the sake of being thorough… what if? Not long ago, Minnesota would have been a team nobody would rush to face in the postseason. They were scoring goals in bunches, they had a dynamite goaltender, their defense was strong and their head coach had a wealth of playoff experience. If they didn’t score, their defense made it possible to win a game with little to no offensive help. Most had the Wild pegged to make the Western Conference Finals. Lately, what Minnesota has displayed is a shadow of that feared team. They may be ripe for the pickings and mentally weaker if the losing continues. Despite potentially going into the playoffs on a low, they still are not a team to be taken lightly. Seeded sixth in the overall NHL standings, Minnesota is tied for third in goals scored and 22nd in goals against. Their goal differential is a positive 48 and that’s nothing to sneeze at. Their power play, penalty kill, faceoff winning percentage and shots against per game are all ranked near the top-ten. Leading the way for the Wild are Mikael Granlund and Eric Staal. Granlund has had a breakout season while Staal has found a renewed career as a free agent signing. Of course on defense, the Wild have Ryan Suter and Jared Spurgeon — two bonafide studs who average over 24 minutes per game — running the blue line. If we compare stats, the Oilers are better in some areas and weaker in others. Their power play is typically top-five yet their penalty kill is about two percent below the Wild’s. Minnesota has scored 20 more goals over the season, but that spread may not hold if the Oilers manage to score in their final six games the way they’ve been scoring as of late. Where Minnesota wipes the floor with the Oilers is in the faceoff circle. It’s not even close. The Oilers top-two scorers are doing more offensively for the team than Minnesota’s top-end talent, but the Wild are a bit deeper at the forward position. Minnesota has eight forwards with 37 or more points. Edmonton is close but only has six. Edmonton’s defense is stronger than it’s been in years, but as improved as it is, it doesn’t quite compare to Minnesota’s. If the Oilers hope to win this series, they’ll have to do it first with speed. Second, Edmonton’s starting goaltender will have to be better than Minnesota’s. The Oilers are a fast, young and skilled team. In that respect, they probably have the edge. They’ll need to take advantage and wear down the Wild and their two blueliners who play nearly half the game. Edmonton’s more balanced defense doesn’t have the one-for-one sprint capacity, but as a unit can likely outlast their opponents in a marathon. In net, Devan Dubnyk and Cam Talbot have been close. Dubnyk has the edge in save percentage and goals against while Talbot has more wins and shutouts on a team that is not quite as strong defensively. Like many opponents in the Western Conference, these teams are pretty evenly matched. That said, the Wild have the season series advantage over the Oilers with three wins in all three games. Edmonton managed to get points out of two overtime losses, but the Oilers couldn’t beat the Wild all season long and there are no “Bettman-points” in the playoffs. On paper, the upper hand probably goes to the Minnesota Wild. Where it gets interesting is when you examine how these two teams may finish their respective regular seasons. If Minnesota continues to struggle and Edmonton continues their positive momentum, this could be a tale of two completely different teams facing each other than the ones that met in the regular season.